Atlanta is an alpha city, playing a significant role on the world stage as a major transportation hub and influential financial and economic center with key national and global functions. But it is also infamous for suburban sprawl, gridlocked highways, the highest income inequality in the country, and a history of racial injustice. Atlanta proper with a population of only 454,000 in a metropolitan area of six million is also one of the least livable cities in America in terms of the destruction of inner city neighborhoods by urban renewal, lack of sidewalks, inefficient public transit, and scarce outdoor recreation opportunities. Affordable decent housing is increasingly hard to come by as affluent post-industrial workers are moving back to the largely black core in the national trend of reversing white flight. Can we stop suburbs from becoming the new ghettos of the poor by fostering dense, diverse, mixed-use, transit-friendly, safe, healthy and vibrant urban centers? In City on the Verge: Atlanta and the Fight for America’s Urban Future acclaimed author and Atlanta native Mark Pendergrast tells the story of a promising catalyst for that city’s revitalization from a “what if?”master’s thesis to a $4 billion 30-year project underpinned by a grassroots movement. The vehicle for this ambitious makeover is the Atlanta BeltLine. The BeltLine trail necklace connecting to existing and planned parks encircling downtown seems like an opportune solution to a wide range of post-industrial ills. Yet the process of putting the components together is complicated and time-consuming, with many unanticipated twists and turns involving countless trade-offs, compromises, and consensus building among highly disparate personalities and interest groups. And completion of the entire pedestrian trail and park loop by the 2030 deadline is by no means a sure thing, while it is still not clear that streetcars will even follow the entire BeltLine. 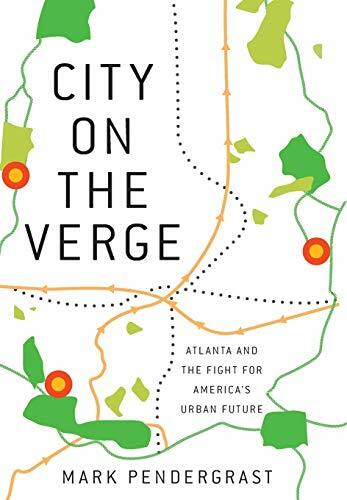 Other than Atlantans interested in their roots, current socioeconomic challenges and future growth, as well as planners, sociologists, community developers and the like, who should read this book? The answer is anybody who recognizes the imperative of building more sustainable cities and who would appreciate an engaging urban history explaining how the BeltLine project came about, in tandem with alternating chapters exploring relevant Atlanta history in key areas such as race and public health. “In literally encircling the city it [the BeltLine] provides a metaphorical narrative hoop on which to organize the book.” And by constructing a physical thread linking highly disparate neighborhoods while fostering a booming economy the BeltLine offers a community-building model for the rest of the country. The second part of the book uses the BeltLine as a lens for exploring the disparate neighborhoods in the four quadrants adjacent to the transit corridor as well as selected areas outside the Atlanta city limits and downtown. Via an urban ethnography relying heavily on field trips, extensive interviews and participant observation, Pendergrast gives us a glimpse into the many Atlantas within the rich/poor and racial divide and the unforgettable characters who epitomize the development dilemmas at hand. We become familiar with the affluent, leafy suburbs of the northern arc of the BeltLine, the chic, walkable neighborhoods of the East, the struggle to improve the blacker communities of South Atlanta, and the blighted Western sections with their boarded-up buildings. Next Pendergrast introduces us to a selection of Atlanta suburbs “Outside the Perimeter” (OTP) so that we get a sense of the magnitude of the segregation and sprawl that the metropolis is trying to overcome. Gwinnett County used to be a classic white flight suburb but is now over 50 percent minorities. Clarkston is a refugee hub, as is nearby Stone Mountain (the re-birthplace of the Klu Klux Klan). Clayton County is struggling. Serenbe is a planned New Urbanist community for the affluent. The corporate nucleus of metro Atlanta has shifted from downtown to oxymoronic Perimeter Center further exacerbating the traffic tangle. Meanwhile: “While the BeltLine seeks to link Atlanta’s disparate races and socioeconomic levels, it encircles a troubled downtown area that suffered severely from white and black flight and became a kind of hole in the BeltLine donut.” A renaissance has begun, but it remains to be seen if gentrification will drive out the remaining poor or include them. Pendergrast walks the BeltLine, at times bushwhacking through the kudzu in the still unimproved sections. He talks to the homeless, the police, the neighbors, the volunteers, the social workers, the drug dealers, the homeless, the activists, the new immigrants, the developers, the business owners, the old guard, the hipsters, and professionals flocking back to the city to roost near their well-paid jobs. “The BeltLine, in encircling the city, connects areas whose inhabitants hardly know one another now.” And as such the trail may be a signpost to breaking down barriers between worlds so near and yet so far apart. The demand is already there. Completed trail segments already attract 10,000 walkers on weekends. Such opportunities for public mingling are sorely needed, as although entrepreneurial Atlanta had been said to be “progressive” compared to much of the south by being “too busy to hate,” racial issues have loomed large from the Civil War through the Civil Rights era to present day neighborhood segregation and race impacted funding for rapid transit. These divides come across most clearly when Pendergrast grounds his narrative in his own lived experience growing up in an affluent white suburb of privilege. His family’s black maid became his second mother until he went off to Harvard in 1966. She lived only seven and a half miles away, yet Pendergrast never visited her small, well-kept home. The BeltLine represents an attempt to bring these worlds closer. Unfortunately, under the new president automobiles, infrastructure and growth are prioritized over public health, affordable housing, community building and sustainable living. However, it is better to keep up the pressure for change rather than continue to accept increasingly separate and unequal lives.